Scuba Diving Madagascar offers some of the best Scuba Diving in the world – Why you might ask? Because Madagascar was cut off from the rest of the world under a Socialist Government regime for approx. 40 years, leaving most of the coral reefs untouched by humans. Madagascar was only opened to tourism as recently as the mid 1990’s. The Tropical island of Nosy Be in the north of Madagascar lies just above the tropic of Capricorn, making for an island with tropical reefs in warm tranquil, turquoise waters of the Indian Ocean. You will be transferred to the smaller island called Nosy Sakatia. Whether you scuba dive or not you will find lots to do. Quiet Tropical Beaches to relax you. A tiny Island to hike and explore with magic scenery for fill your soul. Down to swimming in the warm and soothing tropical Indian Ocean. Snorkelling is also offered and this can even be done right of your beach. 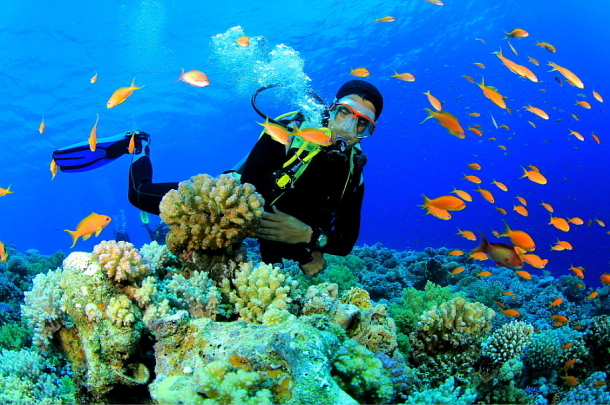 This offers you some of the most beautiful and amazing coral reefs to explore. In places the coral is so close to the surface that even a snorkeler can enjoy the beauty of this amazing underwater world. Nosy Sakatia a small island off the larger northern island of Nosy Be, is where you will find these virginal reefs. Sakatia Lodge offers scuba divers everything they will need to enjoy the underwater beauty, including Nitrox dives, night dives with fluorescent lighting and qualified dive masters to give you some breath taking memorable experiences. There is a house reef which will amaze the not so adventurous, Snorkel amongst the corals.